Mr. Nannini began his journalism career when he published his own newspaper in the sixth grade and charged 25 cents per school quarter for the privilege of reading the only hand-written copy of each edition. The newspaper was a modest success. During his undergraduate years he was a paid newspaper reporter and also worked three semesters as the research assistant to journalism professor Richard Stocks Carlson, Ph.D.
Nannini is a life-long history buff with a particular interest in World War II and the Japanese attack on Pearl Harbor. He once discovered an error in his fifth grade history book concerning the attack. Nannini’s continuing curiosity over several Japanese aerial photographs and the turtling of the U.S.S. Oklahoma lead him to write CHAMELEONS, AN UNTOLD WORLD WAR II STORY, first as a screenplay followed by a full-length novel. Nannini currently writes on a full-time basis. Look for more books from him in the near future along with articles he has composed for World War II History Magazine. 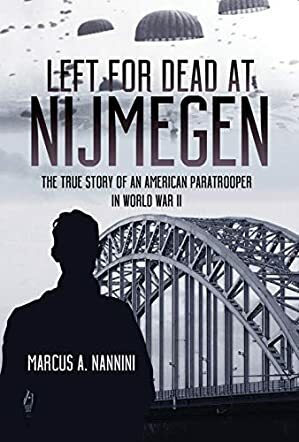 Left for Dead at Nijmegen: The True Story of an American Paratrooper is a nonfiction biography written by Marcus A. Nannini, who spent several years interviewing Gene Metcalfe, who was determined to become a paratrooper, enlisted and was part of Operation Market Garden, a paratrooper landing in Nijmegen, Holland. It was his first foray into the field of battle, the culmination of years of training in every aspect of the paratrooper’s skills in war-craft. Operation Market Garden was, from the outset, a poorly timed and executed operation, one for which the Germans almost seemed to have advance notice. For Metcalf, his inability to hear the order to retreat resulted in an injury that led one of his comrades to believe he was dead. While he was stunned and rendered unconscious for a while, Metcalf was indeed not dead. Over the next 24 hours, he would be imprisoned in a strange castle-like building and interviewed by Heinrich Himmler himself. Thereafter, until the war ended, he would languish in a series of gulags wherein Allied soldiers were deprived of food, forced into hard labor and doomed to die slow and agonizing deaths. What struck me most vividly, however, was the brutal truth behind the treatment of those prisoners of war in the German gulags. While most of us think the Geneva Convention ensured that somewhat tolerable conditions for prisoners was the rule, this book shows how soldiers held by the Germans were often literally starved and worked to death. As I read, I couldn’t help but remember the photographs I’ve seen showing the condition of surviving prisoners of war taken when US troops entered the gulags and death camps of Germany. Those images and Metcalfe’s story paint an unforgettable picture of the suffering and privation inflicted in those camps. Left for Dead at Nijmegen: The True Story of an American Paratrooper is an important work, one that exemplifies the sacrifices made by our military and reveals the reality of the POWs’ struggle to survive under the harshest of situations. It’s most highly recommended.